A man who alarmed the public by spreading a rumor about a SARS outbreak in a military hospital in north China's Hebei Province is to spend two years being re-educated in a labor camp, police said yesterday. The man, surnamed Liu, said that more than 50 patients at the military 252 Hospital in Baoding City had been confirmed with SARS, or severe acute respiratory syndrome, and one patient had died. He spread the rumor to boost the click rate on his website, the Xinshi District Public Security Bureau said. Re-education through labor is a form of administrative detention in China, issued by police rather than through the judicial system. It is used to punish people for minor crimes and usually spans one to three years. The Ministry of Health has issued a statement saying that patients at the hospital being treated for sore throats and fever had an infection caused by adenovirus type 55, a common cause of respiratory infections. SARS, swine flu and bird flu had all been ruled out, it said. "There are no critical cases or deaths. Most patients just had mild symptoms such as a fever, cough and sore throat and many didn't need to be hospitalized at all." On February 19, concern grew online over the rumor that newly recruited young soldiers suffering from SARS had been admitted to the hospital. Liu later added that hundreds were in isolation wards and at least one had died. Last Thursday, both the hospital and the Baoding City health administration denied any outbreak of SARS at the hospital. 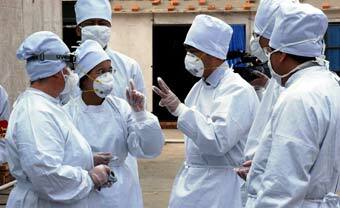 SARS was first discovered in south China's Guangdong Province in November 2002. Officials at first covered up the spread of the epidemic until February 2003 to maintain public confidence, but a growing death toll and rumors forced the government to apologize and vow full candor in future disease outbreaks. SARS later spread rapidly to infect individuals in nearly 40 countries, leading to more than 8,000 people being infected and about 800 deaths, the World Health Organization said.